The Bulgarian young talented artist Elena Georgieva was invited by the IDEA Society commission to participate in the PANGAEA Global Art initiative. Elena graduated from the Academy of Fine Arts in Sofia. Her thematic painting in the context of the PANGAEA topic: “Our society of today and tomorrow”, is called “The creation of life”. 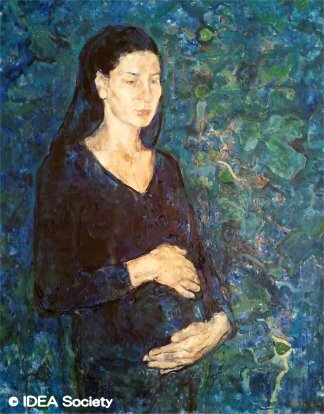 A pregnant woman, symbolizing the present, is gently and carefully holding hear tummy, to secure the wellbeing of the baby, symbolizing the future. The artist shares her believe that the highest achievement is the creation of life and its preservation. The painting acquisition ceremony was held at the Hall of the Union of Bulgarian Journalists, organized by the Secretary General, Ms. Snezhana Todorova, and Ms. Teodora Andreeva. 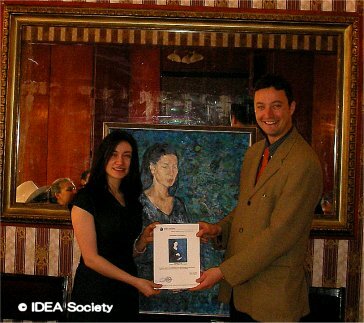 The IDEA Society was represented by its Chairman, Dr. Stefan Stoev. Among the honorable guests, was also Dr. Erika Lazarova, Head of the Section “History of Science” of the Bulgarian Academy of Sciences. Selbst tauchst Du ein ins Nichts, ins Alles - Du gehst. hinüber in das Jetzt, wo Du den Schleier in den Morgen legst. Tiefen in die Tage, die sich bläuern-still dann gegen Abend wenden.